For those of you still suffering from the shrinking-wallet-and-tightening-belt season, here is a quick and easy soup recipe that’s both low-cal and budget-conscious. It can serve as a warm meal for these residual chilly days or as a snack substitute for those leftover holiday sweets. This recipe is built around one staple ingredient: Oden Soup Mix. You can purchase boxes of these at any Asian grocery store. The House Oden Soup Mix and the S&B Soup Mix are two common brands. As for the rest of the ingredients? The rest is pretty much dependent on what you have in your fridge. Nice, huh? It’s the healthy and simple solution for the budgeting anti-cook. Add the oden soup mix to a pot of water (for a large pot, you will likely be using a full soup packet). Heat the stove. Add any vegetables, noodles (be mindful of the calories), wontons, soy sauce or pepper to taste. If you want a little protein, you can add in tofu or an egg. To do this, crack an egg into a small bowl and stir in a dash of water (the water will ensure a fluffy texture). Drizzle the egg mixture into the pot as it boils. Once the soup is boiling, your snack is done. Mix, add, and boil. It’s that easy! 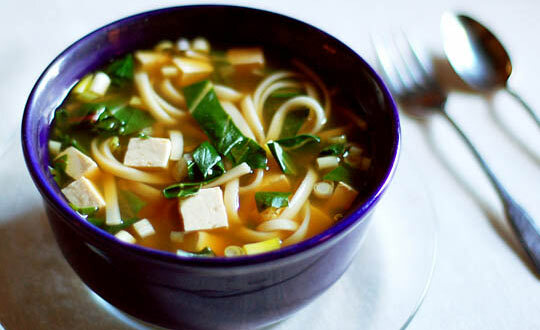 The soup should be no more than 50 calories (if using a full soup packet with soy sauce). The rest will depend on the noodles, egg and vegetables.